While I love sunny days just as much (or more!) than everyone else, if not careful, it can be too much of a good thing! 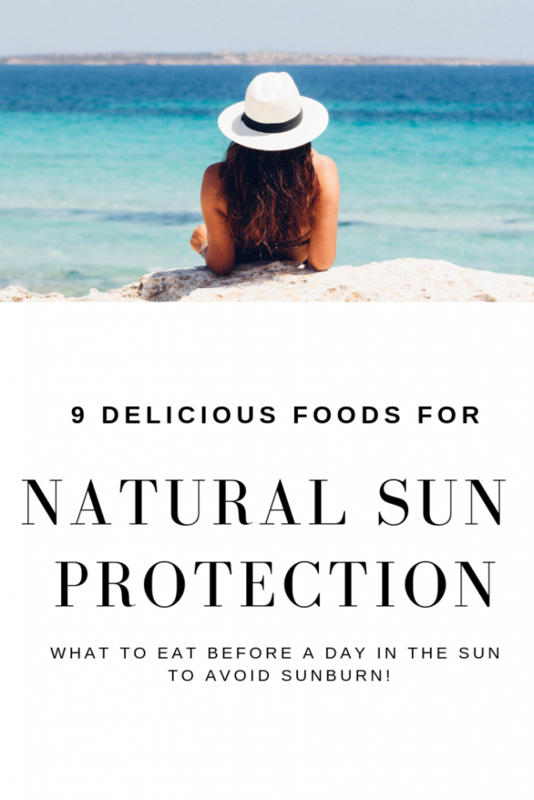 Waking up to a sunny day is certainly a mood elevator for me and I can’t wait to feel the warmth of the sun on my skin, but unprotected sun exposure for too long can also cause some rather serious skin damage if we don’t take a few precautions. Our food choices help determine how firm, radiant and wrinkle-free our skin appears. The nutrients that we feed our body affect its ability to make collagen and elastin, and they supply hydration to our skin cells and inhibit free radicals from forming wrinkles. Not only all that (and that is plenty! ), but, food can also even affect how we react to the sun. Those food choices around the time we are exposed to the sun can act as a natural sunblock in a way protecting us from damaging rays and giving us more glowing and picture-perfect, and yup — even firmer skin. 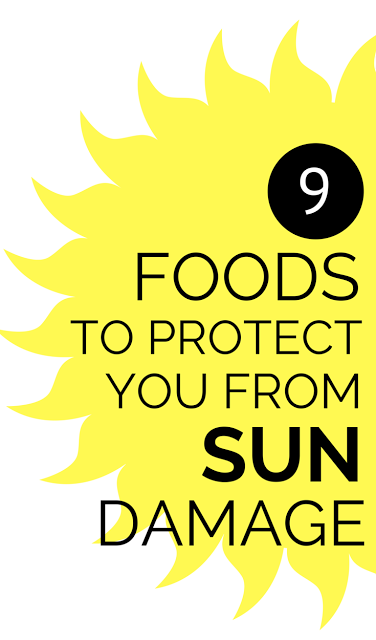 Not only the right sunscreen helps keep the sunburn from forming, but certain foods can help protect you from sun damage, too. 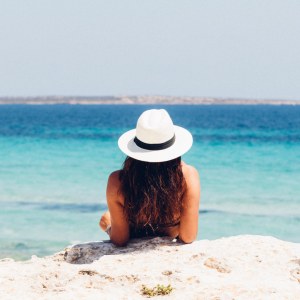 Let’s see what you might want to fill your plates with before you head out for a day on the beach for best sun protection and to keep your skin better protected in the short-run and better looking and skin-cancer free in the long-run. The antioxidant lycopene that is contained in tomatoes and tomato products like tomato paste and ketchup can reduce UV-induced free radicals, show some studies. Another great source of lycopene is an all-time summer favorite – watermelon. Lycopene is better absorbed with fat, so try to combine your lycopene-rich food with a healthy fat. Tomato varieties differ in their lycopene levels as well. Here are tomatoes that have the highest level of lycopene. Don’t miss this: Check out these recipe ideas for the delicious tomato and summertime watermelon. Chop up and throw in a fresh bell pepper or two in your beach bag to munch on as they contain the antioxidant capsiate, which decreases UVB-induced skin damage and inhibits inflammation from sun exposure. Don’t miss this: Find some new ideas on how to prepare those colorful peppers here. Wild-caught salmon is rich in heart-healthy omega-3 fats. But, to add to the list of health advantages, recent research shows omega-3 fatty acids in a diet can help fight the damaging effects of ultraviolet radiation on sun-exposed skin. Wild salmon also contains a potent antioxidant pigment called astaxanthin, which may fight wrinkles and sagging. Don’t miss this: Tap here for my guide to best fishing buying and cooking! And, catch these recipes for fresh salmon. Those colorful berries like both red and black raspberries, blueberries, strawberries, cranberries, and blackberries do a great job of mopping up those free radicals created by the UV rays of the sun. They are loaded with cancer-fighting, disease-preventing antioxidants, too. Don’t miss this: Check out these superfoods that are black and loaded with goodness! Even a spice can do plenty to help you stay skin cancer-free. This research shows a possible benefit of curcumin in turmeric used as a paste to help with melanoma treatment. Curcumin also reduces inflammation and works as an antioxidant to reduce skin damage. Don’t miss this: This is important! Here is a popular post on turmeric and the correct way to consume it! Tea is a healthy beverage all year round, but green tea, brimming with the antioxidant EGCG, provides protection from the sun’s damaging ultraviolet rays. The antioxidants work to prevent DNA damage and help repair existing damage. Choosing green tea can deter dehydration while in the sun and provide proper levels of skin hydration, another key to a youthful look, too. Don’t miss this: The benefits of green tea are many. Find some great ways to prepare green tea besideS sipping right here. Go ahead and break off a chunk of dark chocolate and offer it to your friends, too, as research here suggests that it not only protects our cardiovascular system, but it also protects the skin from sun damage, too. My dad used to always give me natural cocoa butter for my skin and I am glad he did as it is an excellent emollient that preserves skin’s elasticity and moisture. Don’t miss this: Here is an assortment of healthy chocolate recipes to keep you happy. Snack on the polyphenols in pomegranate seeds to protect the skin from both UVA and UVB free radicals and may help with hyper-pigmentation. Don’t miss this: There are so many ways you can use pomegranate in your cooking for better health. How and why to dry brush for your skin. Loads of healthy ways to take care of your skin right here! Face mists of spring water are a luxe trend for treating your skin. Pure spring water settles lightly on the face, refreshing you with particles that you know are not only clean but also contain minerals that are of benefit. Appreciate that, Jenny! Enjoy your summer in the sun safely and sun damage-free! I would add avocado to this list. It's wonderful for healthy skin. You are so right, Jill, that avocado is great for our skin with all the healthy fats in them (and taste fantastic, I might add! ), But, the research does not list it as a sun protector so that is why I did not list it here for this particular post. Always great to hear from you! Such a great question and one I had, too, while looking into this topic. I could not find anything on the amount of the foods to eat though, thus, I did not include that in the post. From my understanding, it is important that you eat these foods before soaking up the rays (hence my post title) as you want the particular nutrients in your system. I am sure consuming them during and after exposure does not hurt either!! So glad you asked this, Charissa. Great article! I never knew any of this….glad you posted it on Friday Features Linky Party! Terrific, Mary. Hope the information here helps you stay sunburn free! I have very sensitive skin. Even though I go under a regular treatment, it is only when I balance my intake that I see real results. Sounds like you have it figured out, Debbie. Thanks for stopping by! You are welcome, Sabrina. Happy to know you learned something here. Great tips as always! I need to consider this, especially since it's impossible to hide from the summer sun! Can't hide is right and who would want to, right? Lots of options to protect ourselves, though. So happy you came by, Janelle! Thanks lots of good information and tips and the good thing is that most of them are yum. Thanks for stopping by Kathleen and yes — all delicious! Fascinating! It makes sense after seeing the studies on it that I shared here. Glad you found a solution, Annmarie. SOO interesting…never thought about using food as protection..thanks for linking up and for the great advice! Pretty amazing how it all works, Sarah! Thanks for your kind words. Glad you learned something from the post, Dannii. Keep making those great choices! All great choices, Launna, every day and especially when spending time in the sun!